Halloween in Churchill is like no other place in the world when Halloween night comes. Every street is patrolled by the town and Manitoba Conservation to insure all kids and families are safe from polar bears.Children are not allowed to dress in white either….no ghosts on this Halloween night. Enjoy these photos from Churchillian Jody Grosbrink and Happy Halloween. Will you be a polar bear this Halloween? Natural Habitat Adventures photo. This Halloween Animal quiz is a fun way to see what animal you should be for Halloween. Natural Habitat Adventures has come up with this as a fun way to celebrate the upcoming holiday and get ready to dress in your animal personality. Halloween in Churchill is quite different from the ones we experience in the rest of the world. Polar bear patrols with floodlights search the town area street by street while children go trick or treating to ensure their safety. However, in Churchill, kids are not allowed to dress as polar bears or in white for that matter. Keep an eye out for an exciting blog post this coming Halloween from Churchill! Another report from the kloffts adventure to Churchill with Natural Habitat Adventures this past fall. Check out their travel website at Go See It Travel for more photos and blogs about their travels! All of us were anxious to see polar bears, but we weren’t spotting any on our first evening out. We did see the most incredible sunset on the tundra, and even though we were all a little disappointed, we couldn’t help but feel privileged and awed by the environment! We put our cameras away and enjoyed dinner set out in the rover on the dark tundra. Then just as we were getting ready to leave, someone spotted a mother bear and two very young cubs outside of the rover, walking right in front and beside the vehicle. Too dark to photograph, we could see their white fur glowing from the dim interior lights of our polar rover and just enjoyed the magical moment of seeing polar bears in the wild for the first time! Polar bear family wanders the tundra in Churchill Wildlife Management Area. Jeff Klofft photo. Polar bears nursing in the CWMA. Jeff Klofft photo. Sleeping polar bear near the Hudson Bay coast. Jeff Klofft photo. Polar bear yawning from a little stress. Jeff Klofft photo. Reluctantly, it was time for us to start our journey back to the launch. The guides and drivers keep the schedule, even though we could have could stayed out on the tundra forever after the exciting bear sightings we had on Halloween! The trip back was not disappointing, enjoying the beautiful scenery,We enjoyed the rover ride through lakes and over rocks, and we even spotted some more wildlife! Silver fox roams the tundra in Churchill. Jeff Klofft photo. This trip with its focus on polar bear conservation, demands that we observe but not disturb, so sometimes the bears are at a long distance, and we must watch them from where we are. Of course, the bears have no such rules, and frequently, these smart, curious animals would see the rovers and want to do a little exploring themselves. That’s what happened in this case. A mother bear and what we later discovered was two female cubs were sleeping, but once we stopped about 1/2 mile away, one of the young cubs was curious and started making her way towards our rover and the others parked near us. She looked back at her more timid sister and slumbering mother, and seemed to be urging them to come explore with her. She started out and before long, her sister followed along behind. After they got a certain distance away, mamma bear heaved herself up and plodded along behind her curious off spring. Pol;ar bear cubs approach the polar rover within a few feet. Jeff Klofft photo. The family of bears walked the whole line of rovers prompting us to ask our driver and guide just how much they had paid the bears for the encounter! After a few minutes of curious sniffing the bears moved on providing us with incredible photo opportunities! Polar bear cubs sniffing out the danger. Jeff Klofft photo. Polar bear family moving to safety away from a male bear. Jeff Klofft photo. Last November Churchill had a polar bear attack within the town limits. 30-year old Churchill resident Erin Greene was attacked by a bear in the early morning hours following a Halloween party. Former tour guide Bill Ayotte was awoken by Ms. Greene’s screams and he quickly rushed to action and saved her life. Mr. Ayotte grabbed a snow shovel and ran to the road where he began clubbing the polar bear over the head causing the bear to release Ms. Greene from his grasp. The bear turned on Mr. Ayotte and was on top of him in a flash. By this point of the attacks the entire neighborhood was awake and observing the incident from their doorways or windows. Another neighbor, 18-year-old Didier Foubert-Allen did more than just watch and his actions most surely saved Mr. Ayotte’s life. Mr. Foubert-Allen ran inside his residence and grabbed his shotgun and fired off 18 rounds of shells, two of which struck the bear, though proved to provide little relief from the attack. Most of the rounds were fired over the head of the aggressive bear but the bear continued to maul Mr. Ayotte. ‘I saw this bear just pounding on Bill, knocking him around like nothing, so I ran back inside, grabbed my shotgun and a box of shells and started shooting above the bear trying to scare it off,’ Faubert-Allen said. 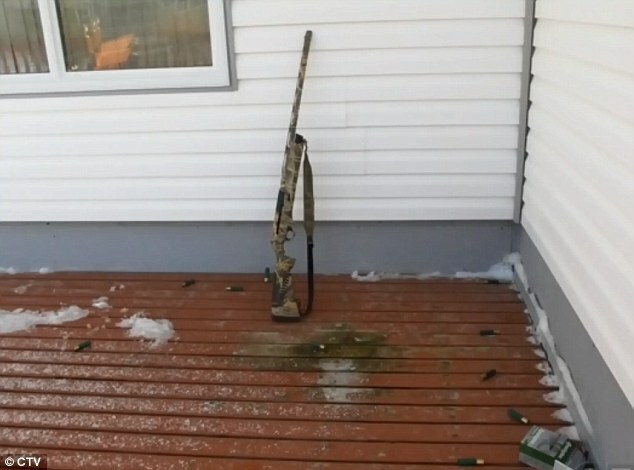 Didier Faubert-Allen’s shotgun and exhausted shells from his attempt to scare off the polar bear attacking Mr. Ayotte. Photo courtesy CTV. With no results from the shooting barrage, Faubert-Allen, barely clothed, jumped in his truck and drove the short distance to the scene. Honking the horn and flashing the headlights finally caused the polar bear to stop and scurry off down the desolate street. ‘I was five feet away from this bear, honking the horn, turning on the high beams and it suddenly stopped and ran up the road. It was almost an instinct. I knew that if the bear attacked the truck, it would get off of Bill,’ Faubert-Allen said. A little later on the bear was put down by Manitoba Conservation officers a short distance from the initial encounter area. Quick action from residents in this incident saved the lives of two individuals. Both Ms. Greene and Mr. Ayotte were treated in Churchill and then airlifted to Winnipeg and were treated at the Health Sciences Centre. Mr. Ayotte incurred serious injuries and Ms. Greene lacerations to the head and arm. 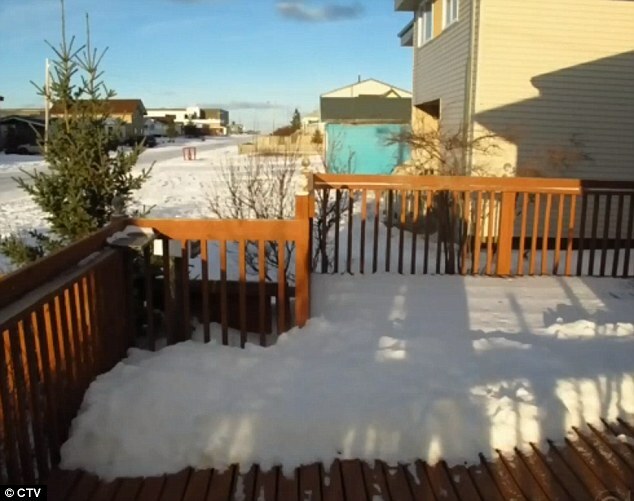 The attack was just one of a few over the past 50 years in Churchill. Luckily nobody was killed in the incident though it serves as a reminder that the region lies in a wild area in which the polar bears roam. With the increased numbers of travelers coming into town yearly, the risk of more dangerous interactions continues to be prevalent.